After surgery ended his season in September, Blue Jays right-hander Aaron Sanchez believes his finger troubles are finally over. 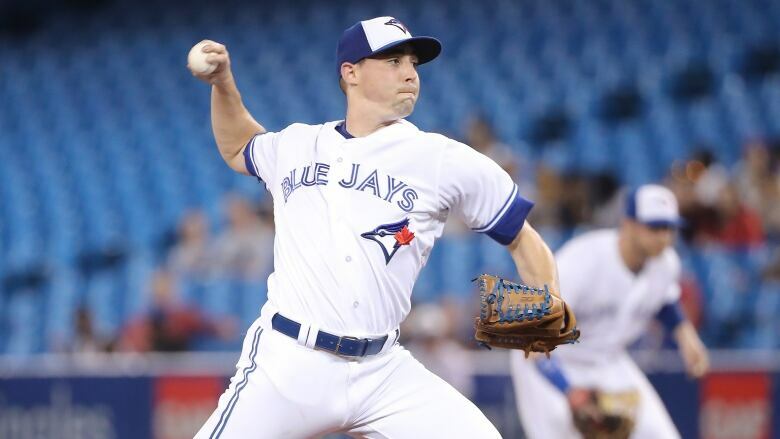 Blue Jays right-hander Aaron Sanchez believes his finger troubles are finally over. "I'm already playing catch, I'm far along in what I'm doing so all signs are positive," Sanchez told reporters Saturday at the Blue Jays' Winter Fest at Rogers Centre. "(My) throwing program is a little slower than normal only because I want to make sure I'm using my fingertips and the ball is coming off my finger the right way. "But everything is going good. The work I've done with my team around me, my therapist, has been tremendous for me and I'm just excited to get going." Sanchez was shut down for 12 weeks after the surgery and started playing catch a few weeks ago. He said he anticipates being "fully healthy" for spring training, which begins with pitchers and catchers reporting on Feb. 14. "The blister problem has been eliminated, I didn't have a problem with that at all last year," Sanchez said. "I think in terms of having a plan for my blisters, those are already cured." "My finger was pretty mangled inside underneath the skin so I think this is going to be something that's going to really show the healthy Aaron," he said. "You've seen it before, the last few years have kind of been something I've battled and I feel 100 per cent and I'm ready to go. "Now it's just about going out there and doing what I do."